Linocut is a printmaking technique, a variant of woodcut in which a sheet of linoleum (sometimes mounted on a wooden block) is used for the relief surface. A design is cut into the linoleum surface with the raised (uncarved) areas representing a reversal (mirror image) of the parts to show printed. The linoleum sheet is inked with a roller (called a brayer), and then impressed onto paper or fabric. The actual printing can be done by hand or with a press. Its refreshing every once in a while to do new things. I like to do linocuts a few times a year almost as a vacation from my usual creative process. Carving and printing gives you a different kind of image, with its own rhythm. Each cut has an impact that contribute to the whole feel of the image. My prints are one color which also make design very important. In the last few years I've done linocuts to commemorate weddings. This year I'm doing an image in honor of my fraternity, Iota Phi Theta. 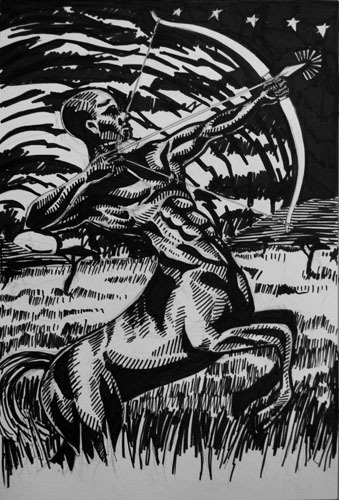 A centaur hunting in the African savannah. I've finished the final sketch and will be begin carving very soon. I'll only be printing an edition of 25. They will all be hand printed and numbered. The prints will be sold for $50 each. Anyone interested in reserving a print should contact me. I'll keep posting as I continue the creation of the centaur.